Late last year the Chairman & CEO of JPMorgan Chase, Jamie Dimon became the laughing stock of the crypto world when he came out railing against bitcoin and the blockchain. On Tuesday, however, he seems to have changed his mind and during an interview with Fox Business, he left viewers with an ominously cryptic message—punn intended—on how the government will control bitcoin. In the interview on Tuesday, however, the megabank mogul expressed his change of heart. As FOX Business reported, Dimon regrets past comments in which he called Bitcoin a fraud at that September banking conference. “The blockchain is real. You can have crypto yen and dollars and stuff like that. ICO’s you have to look at individually,” Dimon said in an exclusive interview with FOX Business. However, after he somewhat apologized for slamming bitcoin, Dimon gave a portentous statement, hinting that he knows something about the government control of bitcoin. 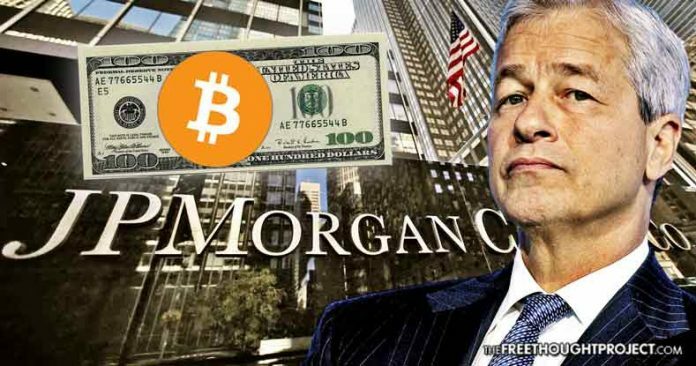 What makes this statement so inauspicious is that it’s not the first time Dimon has alluded to the government controlling crypto and, if anyone knows how the government is going to react when it comes to money, it is definitely the Chairman, CEO and President of the largest American bank, and a former chair on the board of directors of the Federal Reserve Bank. When asked what he thought about the future of bitcoin during an interview with Fortune, Dimon said, “It doesn’t matter, it’s just not gonna happen,” before claiming that the government will make it illegal and begin jailing people for it. Dimon went on to predict that cryptocurrencies will all be government controlled. “There will be no real non-controlled currency in the world. There’s no government that’s gonna put up with it for long,” he said. Whether or not this prediction will come true is still up for debate. However, other governments across the world are not going to miss the crypto boat and have already begun taking measure to move toward their own coins. One of these countries is Venezuela. As TFTP reported last month, Venezuelan President Nicolas Maduro announced that in an effort to bypass U.S.-led financial sanctions Venezuela would launch a digital cryptocurrency backed by oil. “Venezuela is announcing the creation of its own cryptocurrency. It will be called The Petro. It will allow us to innovate towards new forms of international finance for the economic and social development of the country,” Maduro said. Russia’s development bank, VEB is also hopping on the bandwagon as several Russian state ministries are reportedly teaming up to develop blockchain technology. Russia plans to create a fully encrypted, distributed, inexpensive payments system that has no dependence upon Western banking institutions, SWIFT, or the U.S. government to move money across the world. As TFTP reported, Minister of Communications, Nikolay Nikiforov, confirmed that Russian President Vladimir Putin has officially stated that Russia will issue its own ‘CryptoRuble’ during a closed-door meeting in Moscow, according to local news sources. The good news is that even if governments try to control one currency, others will rise in its place and as long as this widescale collaboration and coordination among blockchain users exist, decentralized money will win. The money changing bankers have had their go at the helm—and we’ve seen the massive death and destruction facilitated by it—now, it’s time for the rest of humanity to have their turn.